Phil Mickelson's fifth career win at the Pebble Beach Pro-Am, which he completed Monday morning, has prompted his odds to shorten below those of defending champion Patrick Reed for the Masters. 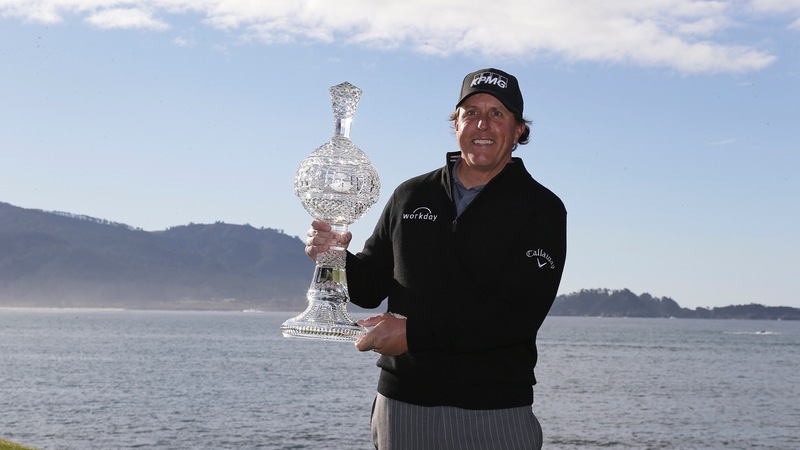 Phil Mickelson's fifth career win at the Pebble Beach Pro-Am, which [he completed Monday morning](https://www.betchicago.com/golf-odds/leaderboard), has prompted his odds to shorten below those of defending champion Patrick Reed for the Masters. Mickelson [opened 40/1](https://www.betchicago.com/2019-masters-odds-tiger-woods-favorite) to win his fourth green jacket (and first since 2010), but was 25/1 in odds released by the Westgate Las Vegas SuperBook shortly after completing his win at Pebble. The favorite for the tournament remains [world No. 1 Justin Rose](http://www.owgr.com/ranking) at 12/1, and while the 38-year-old has never won the Masters, he finished second in 2015 and 2017. Reed has finished in the top-25 of all four tournaments he's played this year, and completed each under par. But the 28-year-old has remained stagnant on the Masters oddsboard at 30/1. Mickelson, 48, would love another Masters, but he's hoping his success this past weekend at Pebble [helps him during the U.S. Open](https://www.betchicago.com/att-pebble-beach-pro-am-results-translate-us-open), which will also be at Pebble -- [in mid-June](https://www.usopen.com) -- and is the only major Mickelson hasn't won. He's finished second an impressive (and excruciating) six times. <a href="https://www.youtube.com/watch?v=5HhFmPnbbSA" class="embedly-card" data-card-width="100%" data-card-controls="0">Embedded content: https://www.youtube.com/watch?v=5HhFmPnbbSA</a> If Mickelson plays like he did Sunday (and two holes Monday after play was suspended due to darkness), he'll have a great shot at the U.S. Open. He shot a bogey-free 65 (7-under) to win his 44th PGA Tour event, including five at the Pebble Beach Pro-Am, tying Mark O'Meara's record. As for [the Masters](https://www.pgatour.com/tournaments/masters-tournament/past-winners-and-runners-up.html), Mickelson has never won at Pebble Beach and Augusta in the same year, and five of the last six years he's [finished the Masters over par](http://www.augusta.com/masters/players/bios/Phil_Mickelson.shtml). The year he didn't (2015), he shot 14-under to finish in a tie for second with Rose, four shots behind champion Jordan Spieth. __MORE:__ [How Pebble Beach results can translate to U.S. Open](https://www.betchicago.com/att-pebble-beach-pro-am-results-translate-us-open) ## 2019 Masters odds *past champions; 100/1 and below 12/1: Rose 14/1: Spieth*, Dustin Johnson, Brooks Koepka, Rory McIlroy, Tiger Woods* 16/1: Bryson DeChambeau, Rickie Fowler, Jon Rahm, Justin Thomas 20/1: Jason Day, Tony Finau 25/1: Mickelson* 30/1: Tommy Fleetwood, Hideki Matsuyama, Reed*, Xander Schauffele, Bubba Watson* 40/1: Paul Casey, Matt Kuchar, Francesco Molinari, Adam Scott* 50/1: Patrick Cantlay, Sergio Garcia*, Marc Leishman, Henrik Stenson 60/1: Cameron Champ, Louis Oosthuizen, Thomas Pieters, Webb Simpson, Gary Woodland 80/1: Alex Noren, Cameron Smith, Brandt Snedeker, Danny Willett* 100/1: Matthew Fitzpatrick, Branden Grace, Charley Hoffman, Billy Horschel, Charles Howell III, Zach Johnson, Kevin Kisner, Haotong Li, Joaquin Niemann, Ian Poulter, Charl Schwartzel* __PLAY:__ Our [free daily contests](https://betchicago.chalkline.com) for a chance to win a BetChicago prize pack.